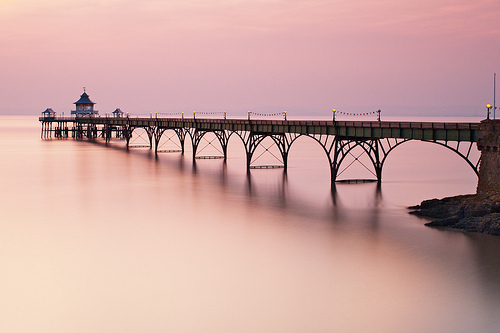 Originally built in the 1860s, Clevedon Pier in the small North Somerset town of Clevedon, was designed to allow paddle steamers to dock for services to South Wales and other places. Since 2001 it has been a Grade I listed structure making it - since the sad fire at Brighton's West Pier - the only Grade I listed pier open to the public, as well as being among the earliest Victorian piers still in existence. Even after the building of the Severn Railway Tunnel to South Wales, the pier continued as a docking station for pleasure boats which took passengers around the Severn Estuary and recent years have seen a reprise, with boats such as the MV Balmoral and Paddle Steamer Waverley taking passengers from Clevedon to destinations such as the islands of Flat Holm and Steep Holm, as well as Penarth and Ilfracombe. Despite a collapse of two elements of the pier in 1970, an commendable campaign by the Clevedon Pier Preservation Trust saved the pier from demolition and after many years it was finally completely reopened in 1998.